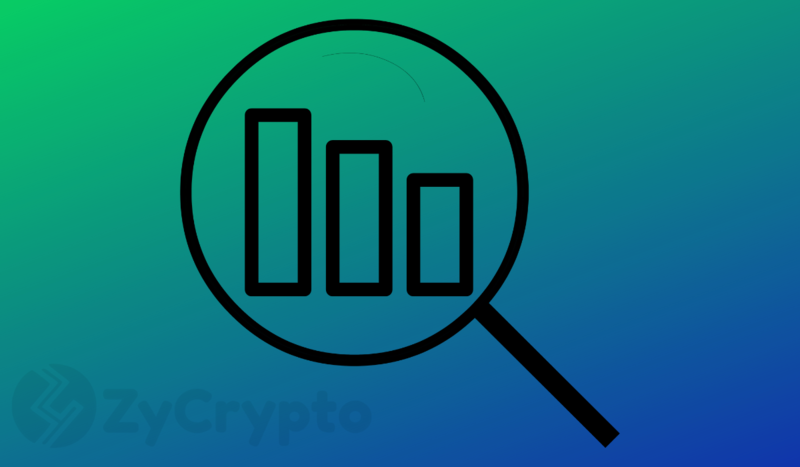 The Iota/USD pair began the day trading at $0.2992 and is now at $0.2964 which represents a 1% drop in its price. 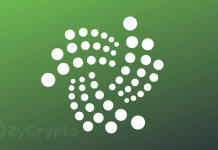 Throughout the day, Iota hit a high of $0.3 and a low of $0.2984 with support at the $0.29 mark and resistance at the $0.3004 mark. As the day began, the 9 day EMA (B) above the 30 day EMA(C). However, the latter moving average crossed over on top, signaling a strong Bullish trend. The two moving averages also formed a contracting triangular pattern as can be seen between B and C which also shows the strong downward momentum. 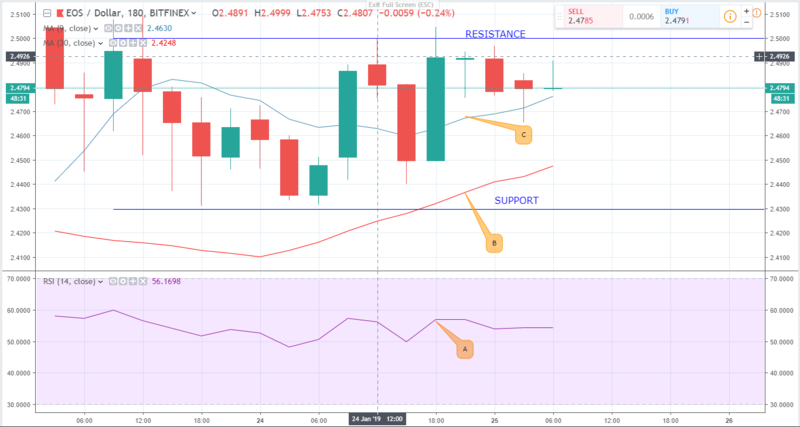 In the markets, the slight upward movement in price as the day began pushed investor confidence up as can be seen in the RSI (A) before it finally started coming down again as the price went down. The downward movement shows increased sales as investor confidence reduces due to a drop in price. All indicators point towards a Bearish momentum in the short term. Unless the Bulls up their momentum, the price of Iota is likely to dip further. Being the most watched cryptocurrency due to its popularity, most investors are hoping that BTC will finally break its duck by making an upward movement. 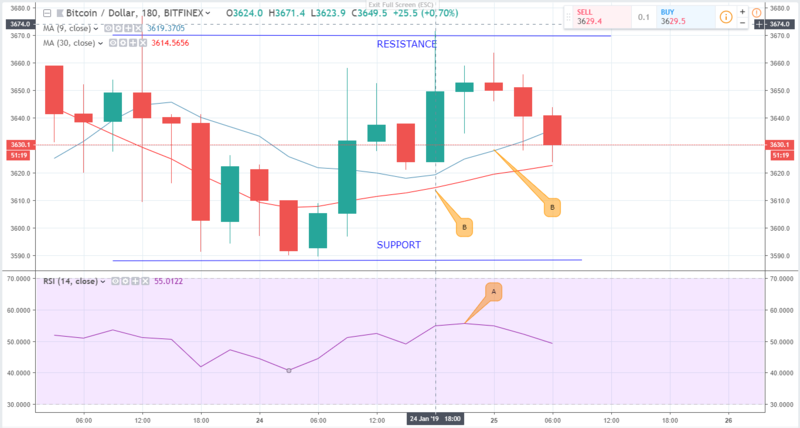 At the moment, a rally towards the psychological price of $4000 is desirable seeing that the BTC/USD pair has over the last 24 hours found consolidation above the $3600 mark. Bitcoin is up by 0.5%, having gone from $3621 to $3640. 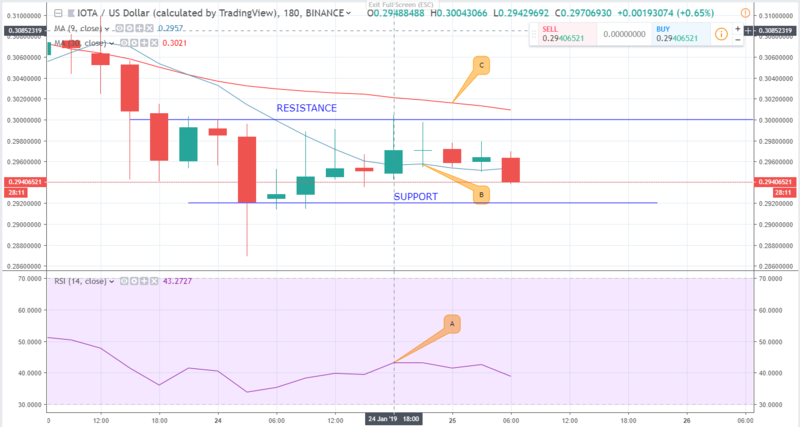 The upward movement has helped investors’ confidence in BTC, seeing that the RSI (A) rose to 55 before it came down to 50. The movement indicates that investors are preferring not to sell but rather wait for better prices. Both EMAs (B and C) form a reverse contracting triangular pattern which shows that Bitcoin may rally upwards to the $4000 mark if the Bullish momentum is sustained. 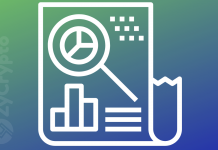 Over the last 24 hours, EOS has moved from $2.4666 to the current $2.4642. 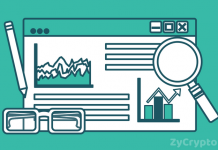 This represents a slight 0.04% drop in the Altcoin’s price with strong support at $2.4 and support at $2.5. On the upper side, EOS hit $2.5045 and $2.4333 on the downside which shows a strong Bullish momentum. In the chart, the 9 day EMA (C) was dominantly above the 30 day EMA (B) which also signals a strong Bull Run. The 9-day EMA is currently acting as price support which also shows the strong upward momentum. In the markets, Investor sentiments were up due to the strong Bullish momentum as seen in the RSI (A) which was at 60 (near the undersold area) before coming down to 55. All indicators point toward a Bullish outlook in the near future. Unless the Bulls bottle the upward momentum, the price of EOS is expected to rise even higher.